Every once in a while it gets a cleaning and dusting. We pull out the vacuums (large and small), the coats and hats and mis-matched mittens, the boxes of light bulbs and old picture frames and the dozens of empty bags stuffed inside one another. For a few months, we are able to see open floor space and step inside to find the coat or scarf we need, but before you know it, the ironing board is once again falling on us and there is not a matching glove to be found. Ours has never housed a wizard, though my daughter and I once spent a fairly comfortable over-night on the floor during a tornado warning. That was early in our home's history, before we began accumulating "stuff" that needed to be hidden. For the last year, the star resident has been my "Chanel" jacket, who is patiently waiting to have her sleeve vent buttonholes finished, patch pockets, trim and (finally) the chain hand-stitched in place. I pretend not to see her, unless she has been accidentally knocked to the floor, in which case I gently place her back on the dress form and close the door. On New Year's day, I found my way over to the Stitcher's Guild forum and learned about SWAP. 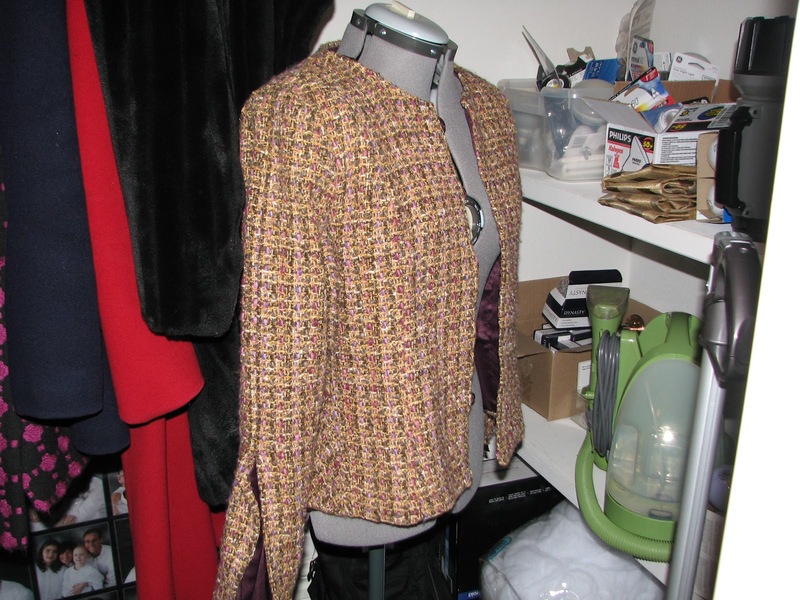 It seemed so simple -- finish the jacket and just sew ten other garments for myself between now and April. Maybe because I'd been on vacation for almost two weeks it seemed so simple to complete. TEN OTHER GARMENTS?! For someone who rarely sews for herself, this is a very lofty goal, but I'm taking it on anyway. At the very least, I will be thrilled to finish the collection by the end of 2013 and will be completely shocked if I finish by the April deadline. 3) brown RPL for slacks. Including the jacket, that's only four pieces, leaving me with another SEVEN to plan out, let alone sew! Nonetheless, I have a more-than-vague plan and I'm going to start it. I am going to start it as soon as I finish the fleece and flannel extravaganza that is lined up ahead of my wardrobe.